This page has 2 types of hamstring stretches. The hamstrings are the muscles on the back of your thigh. 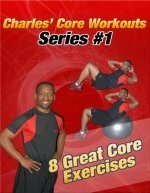 Stretching Exercises are an important part of all fitness programs and workout routines. Many lower back exercise programs include hamstring flexibility exercises. Because we sit so often our hamstrings can get tight, and this can negatively affect our movement and lower back. When the hamstring muscles are flexible, they allow better movement of the pelvis. When the pelvis moves well, all the core muscles work more efficiently and less pressure is placed on the hips, spine, and lower back. Below are 2 ways you can stretch your hamstrings. 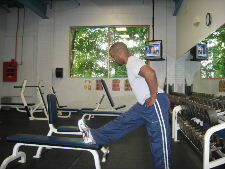 You can stretch your hamstrings statically (passively) or actively. Starting Position: Place your heel on a step or bench. Form: Keeping your knee straight, hinge forward from the hip until you feel a mild to moderate stretch in the back of your thigh. When you feel a good stretch, hold that position for 20-30 seconds before releasing the stretch and moving on to the other side. Personal Trainer Tips: Move in a slow and controlled manner. Repeat the stretch 1-3 times on each side depending on how stiff your legs feel. This is a static stretch, which means there is no movement. Avoid bouncing to reach further. Simply move as far as your body allows. Performing static stretching exercises after a 5 minute cardio warm-up will lead to greater improvements in flexibility. Stretching should be performed 3-7 days a week. Starting Position: Lie on your back with left knee bent and your left foot on the floor. Bring your right thigh to 90 degrees and place your arms behind your right thigh. Form: While keeping your thigh perpendicular to the floor, use your muscles to straighten your right knee as far as it will go. Hold at the top for 2-4 seconds and then slowly return to the starting position. Repeat 5-10 times on the right leg before switching to the left leg. Personal Trainer Tips: This is an active stretch, which means that you use your muscles to actively move through the range of motion. Above are 2 different types of hamstring stretches. Static stretching is best when you have significantly limited motion and static stretching exercises help to increase flexibility. Active stretching also helps to increase flexibility and is sometimes preferred as a warm up to strength training activities. If you have limited motion in your hips and pelvis flexibility exercises for the hamstrings can increase your range of motion.